Helicopters flew onto Liebs Island at Buckeye Lake today… all in preparation for the possible dam failure. 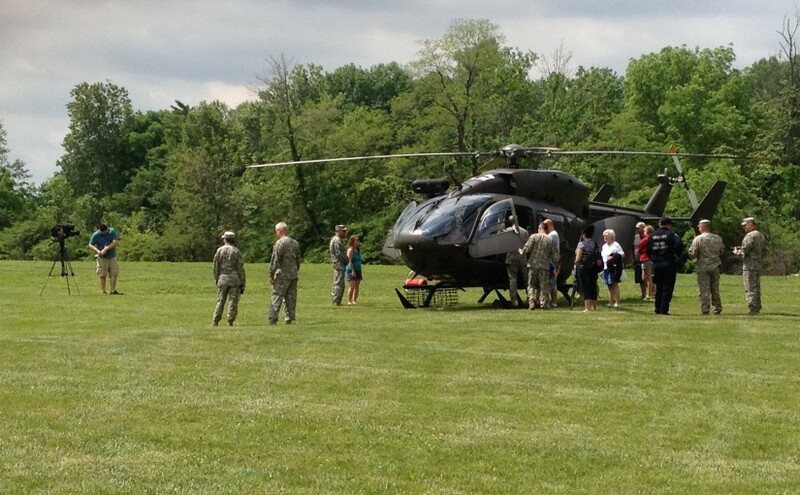 The Ohio National Guard teamed up with Ohio Task Force One to complete the safety presentation.The event featured a two-helicopter demonstration where both land and water rescues took place. Search Team Manager Gene Thomas said that the community can count on these rescue teams to take action in case of emergencies. The Buckeye Lake area has been in a state of wonder and worry since the Army Corps of Engineers released its report that claimed there is potential for catastrophic dam failure. The lake has since then been kept at a winter level. External Affairs Chief for the Ohio Emergency Management Agency Jay Carey said they are prepared for the threat of dam failure. “With the threat and the concern of a potential breach of the dam or dam failure, we wanted to show the local and the state preparedness efforts and the resources we can bring to bear if there is any problem with the dam,” said Carey. You can visit the Ohio Department of Natural Resources’ website for up to date information on the progress at Buckeye Lake.